The changing of the season is a great time to refresh your little one’s wardrobe with some spring baby fashion. But don't be fooled by that pretty blue sky and those blooming flowers. 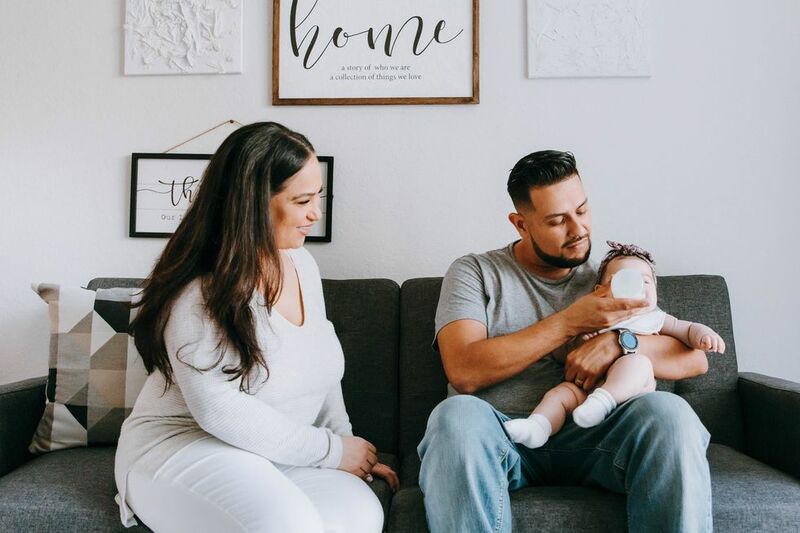 This transitional season comes with highly unreliable temps that can have baby sweating and shivering over the course of one day. So how do you make sure that your child is always appropriately clothed for the fickle weather? First, dress him with an extra layer. If he gets sweaty, red or hot to the touch, strip a layer off. When it comes to harmful sun exposure, the first and best line of defense is covering up. Stay in the shade whenever possible – especially during peak hours, from 10 am to 4 pm. But you'd still be wise to lather baby with SPF 15+ sunscreen (and reapply every two hours or after swimming). 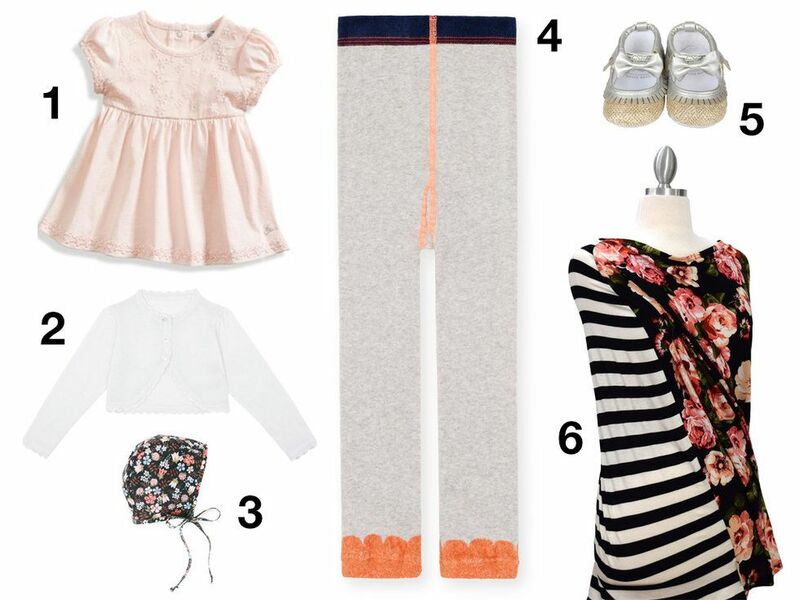 And now for the good stuff: baby’s spring style. 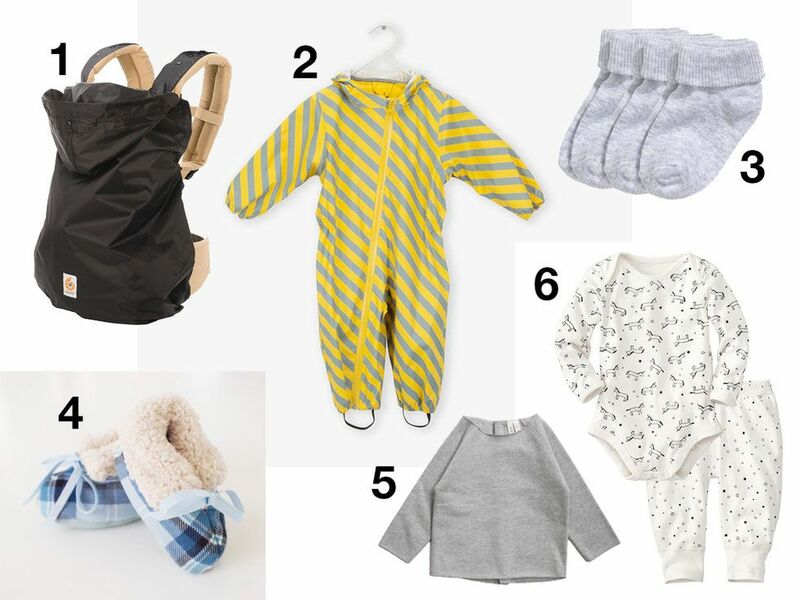 Whether you plan on taking the whole family to the beach for Memorial Day weekend or conquering spring showers, here are 4 spring baby fashion looks that will get your wee one through spring, rain or shine. An afternoon with the grandparents is the perfect occasion to doll baby up in a super-cute floral dress (if possible, with bloomers to cover her little bum at all times!). The sundress is not only posh and comfortable – it's a layering building block. Complete your little girl’s outfit with a bonnet, a bolero cardigan, leggings and a pair of ballerinas to keep her toasty from heady to toe as the temperature shifts. Finally, a nursing cover that moonlights as a car seat cover will help with breastfeeding breaks and on-the-go catnaps. 1. GUESS Kids, Floral Dress and Bloomers Set: $21.90; 2. Jojo Maman Bébé, Girl's Bolero: $30; 3. Briar Handmade, Midnight Blooms Bonnet: $36; 4. Hansel from Basel, Mini Tipsy Legging: $23; 5. Rosie Pope, Glamour Moccasins: $20; 6. Covered Goods, Mismatch cover: $34.99. 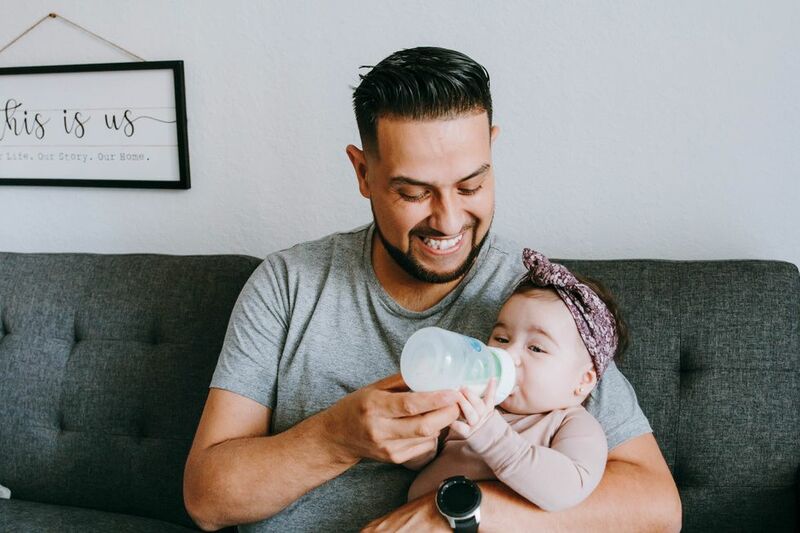 If baby boy has a hot date in the park, ditch the fancy frocks and opt for a lightweight romper that snaps at the crotch for easy diaper changes. Soft-sole moccasins are not only sure to stay put, but they protect your little one’s tootsies against chilly breezes. For extra warmth, tuck in a onesie under the playsuit and slip a knit hoodie over it. Polarized shades are a must to shield his peepers from harmful UV rays. If the playdate wears him out, cuddle up close to him in a linen ring sling, which, as an added bonus, will enhance your style. 1. Burt's Bees, Set of 5 Short-Sleeve Bodysuits: $26.99; 2. tinycottons, Stripes Woven Logo Onepiece: $72; 3. Zara, Knit Cardigan with Hood: $29.90; 4. Freshly Picked, Loom No. 1 Moccasins: $60; 5. Babiators, Black Ops with Blue Lenses: $45; 6. WILDBIRD, Hummingbird: $64.99. If you're flocking to the water, make sure the youngest member of the family is fully prepped for a little fun in the sun. Swimwear should have a UPF protection of 40 or more, and a sun hat is essential to shade your baby’s face and his baby blues. 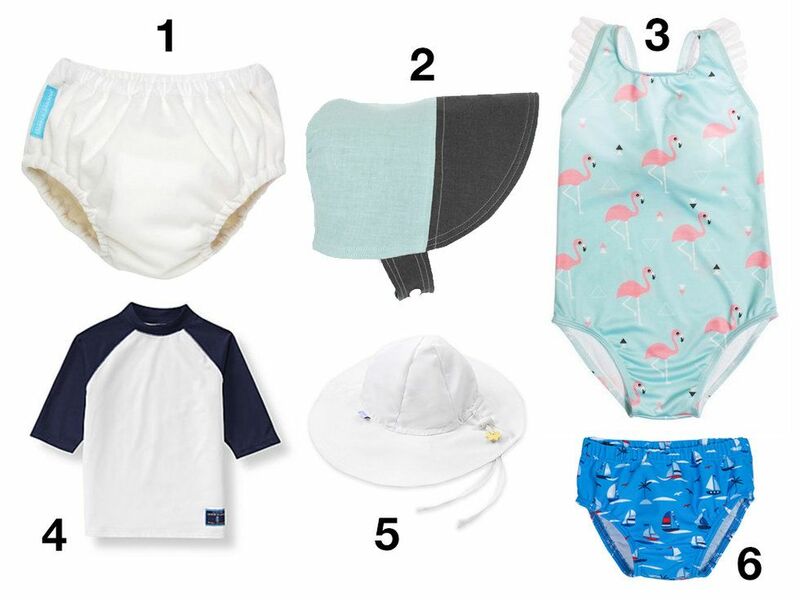 A reusable swim diaper is a parents’ best friend to contain little accidents, but if the white diaper is too staid for your taste, make a fashion splash by pairing it with a swimsuit that features fun and colorful child prints. Finally, a rash guard provides extra coverage against the sun and helps minimize the use of sunscreen. 1. Charlie Banana, Reusable Swim Diaper: $14.84; 2. Little Sun Hat, Aqua/Slate Modern Bonnet: $38; 3. Olivia + Ocean, Flamingo Swimsuit: $39.99; 4. Janie & Jack, Colorblock Guard Rash: $29; 5. iPlay, Brim Sun Protection Hat: $12; 6. Platypus Australia, Baby Brief: $25.95. You know what they say: April showers bring May flowers. But commuting in the rain with an infant in tow isn’t as pretty as peonies and cherry blossoms. 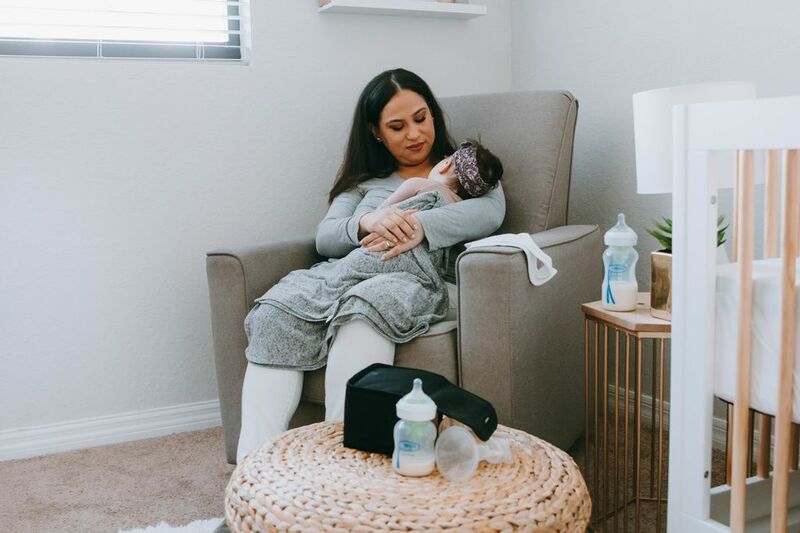 When at home, keep on layering: a two-piece loungewear, a soft fleece sweater, socks, and a pair of booties are all you need to keep your newborn comfy on a colder, rainy day. If you decide on jumping puddles and braving downpours, get ready to waterproof baby’s look with a carrier rain cover or a rain coverall. 1. Ergo Baby, Rain Cover: $39; 2. Go Soaky, Lion King Coverall: $79.53; 3. H&M, 3-Pack Socks: $5.99; 4. Seraphine, Blue Tartan Fleece Lined Baby Booties: $59; 5. Gray Label, Baby Jumper: $38.64; 6. Hanna Andersson, Wiggle Set in Organic Pima Cotton: $22.50.